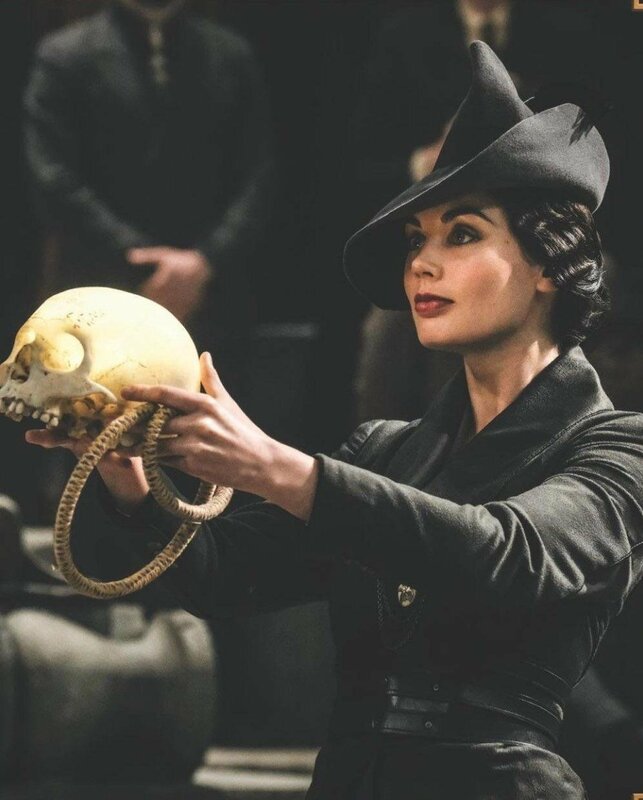 What's the deal with Grindelwald's magical skull bong? Grindelwald is depicted on several occasions smoking from a creepy skull. It's carried with reverence and he uses the smoke to generate images of the future for his audience. The wiki is woefully vague about it, referring to 'theories' that it helps him with his abilities as a seer. Is there a back-story behind this intriguing object and why he uses it? Is it a necessary part of the "Seeing" magic he uses? The skull hookah Grindelwald has lets others see his visions. In a podcast, the director of Fantastic Beasts: The Crimes of Grindelwald, David Yates, explains what the skull hookah does - it allows him to show his visions to others, like the people following him. He still has the ability to See even without the skull, the skull is just a method for him to let others see his visions as well, like when he shows the people at his rally visions of another war. Grindelwald is a Seer. He has this ability to foresee the future, and that skull device is an opportunity for him, a means [that] allows him to present his visions to the people who follow him. So it’s fundamentally a part of that magic. But he has the gift of forward sight, basically, which is an extra threat to our key protagonists. From the description David Yates gives, the skull doesn’t seem to give Grindelwald additional visions when he “smokes” it or contribute in any way to his ability to See when he uses it. It’s basically just a projector for the visions he already does have. The engravings on the skull show Grindelwald’s symbol, then the text below that reads “Für das Größere Wohl”, which is German for his slogan, “For The Greater Good”, and below that is 1898. The 1898 most likely represents the year he first got his slogan, which he got the idea for in a letter sent to him by Albus Dumbledore, who he’d have met in 1898 going by the established timeline in the books. Not the answer you're looking for? Browse other questions tagged harry-potter fantastic-beasts the-crimes-of-grindelwald gellert-grindelwald or ask your own question. Why aren't Grindelwald's events called the First Wizarding War? What's the deal with the portraits? What's the deal with Gnarlak's fingers? Can many “regular” animals interact with magical people, creatures, and places in Harry Potter world? What is the species of Gellert Grindelwald's pet? What was going on with Grindelwald's tongue? Did the Muggles see the magical things happening in The Crimes of Grindelwald? Who was Credence travelling with on the boat? What's magical about the number seven?